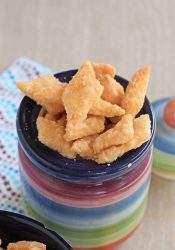 Shakkarpara | Shankarpali are sugar coated diamond shaped biscuits that has been my favorite as a child to this date. 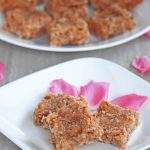 Enjoy this traditional sweet for this Diwali. 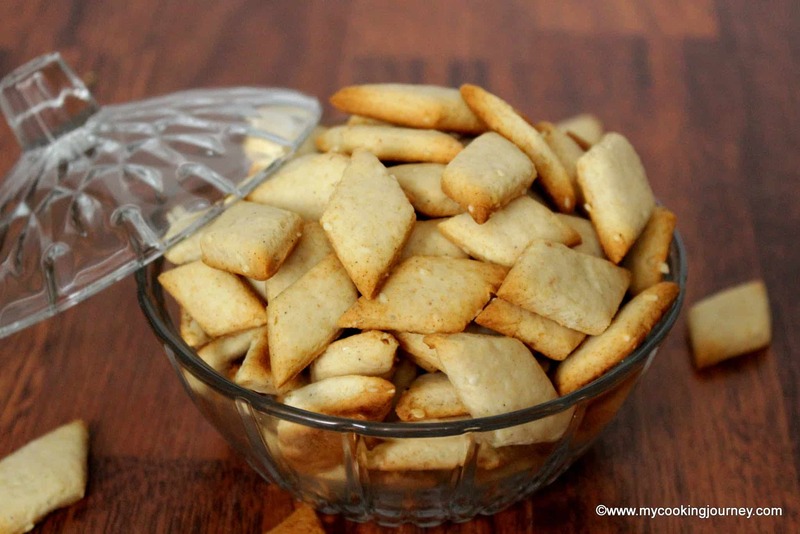 Shakkarpara | Shankarpali are sugar coated diamond shaped biscuits that I grew up eating. 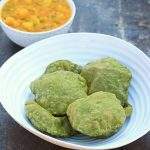 I used to really enjoy eating this as a child and I thought what better to make this for my kids for Diwali. 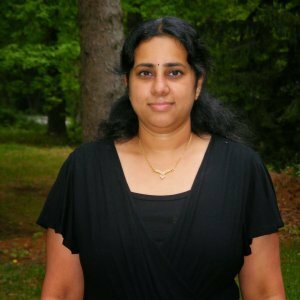 There are two versions of Shakkarpara | Shankarpali that we can find. One is the kind where the sugar in incorporated in the dough and then it is cut into pieces and deep fried. I have made that version before, but made it a little more healthier by making it Baked Sakarpara. 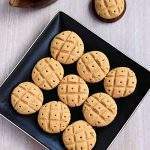 Very often I also make the spicy diamond biscuit which is a savory version of the almost similar recipe. I am though a little partial towards this sugar coated Shakkarpara when compared to the other version. 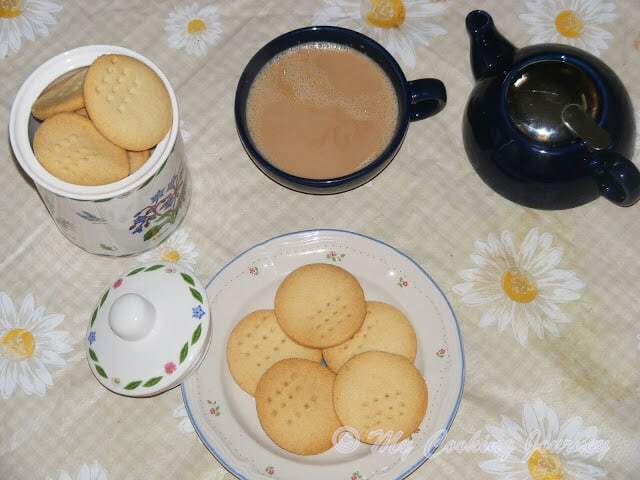 The glossy white sugar layer over the crunchy biscuit is what appealed to me as a child as well as to this day. My boys totally loved this for their weekend snacking. 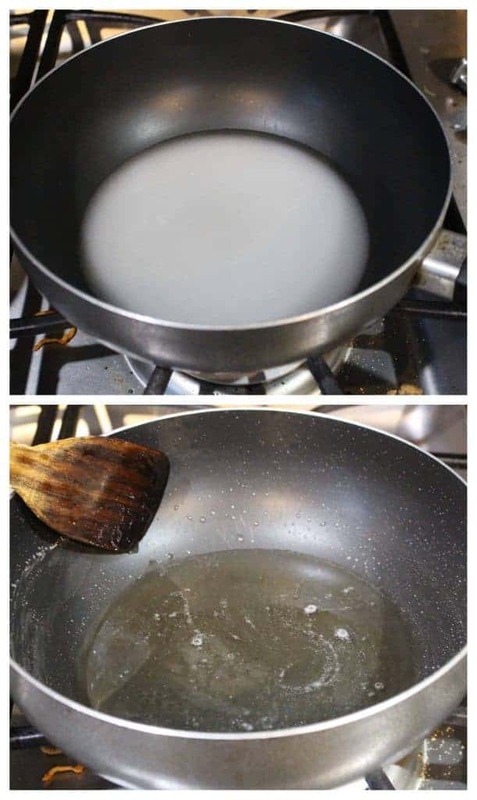 The making of the sugar syrup can be a little tricky, but it is not too bad. Just make sure that the syrup is really thick as otherwise they will not crystallize properly over the shakkarpara. Also this could make the shakkarpara become soggy. 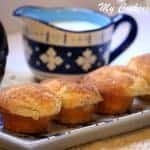 It will take a couple of trials and error to figure it out, but if you have to make a mistake, make the sugar go over, as we can always add a little bit more water and heat it up being it back to the right stage. 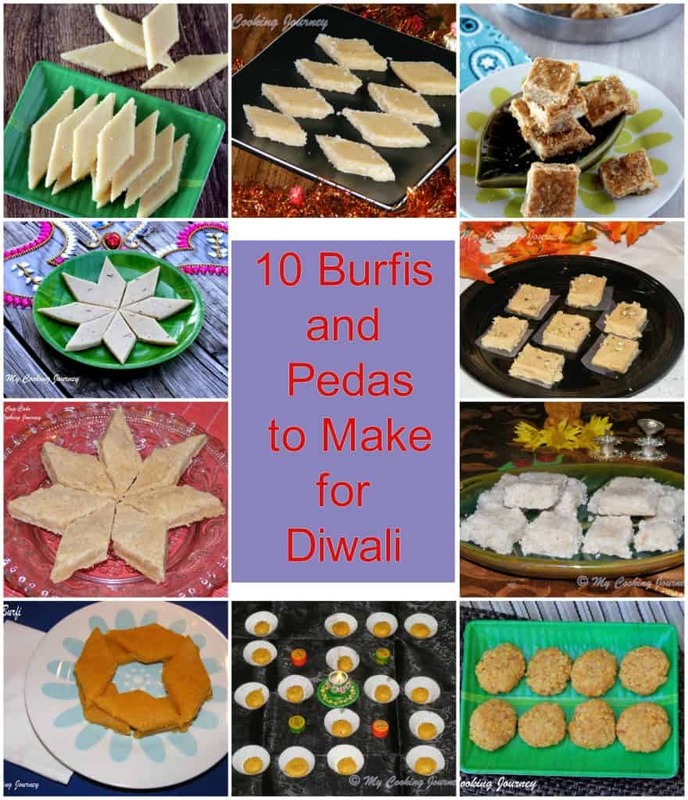 After my Coconut Gulkand Burfi and Aloo Bhujia, this is my third recipe under the theme Diwali sweets and snacks for this week’s Blogging Marathon. Combine the flour and the salt in a bowl and add the melted ghee to it. Mix well with your fingers to combine. Slowly add water and make a stiff dough. Knead the dough for couple of minutes and let it rest for about 30 minutes. Make sure you knead the dough to a stiff consistency. 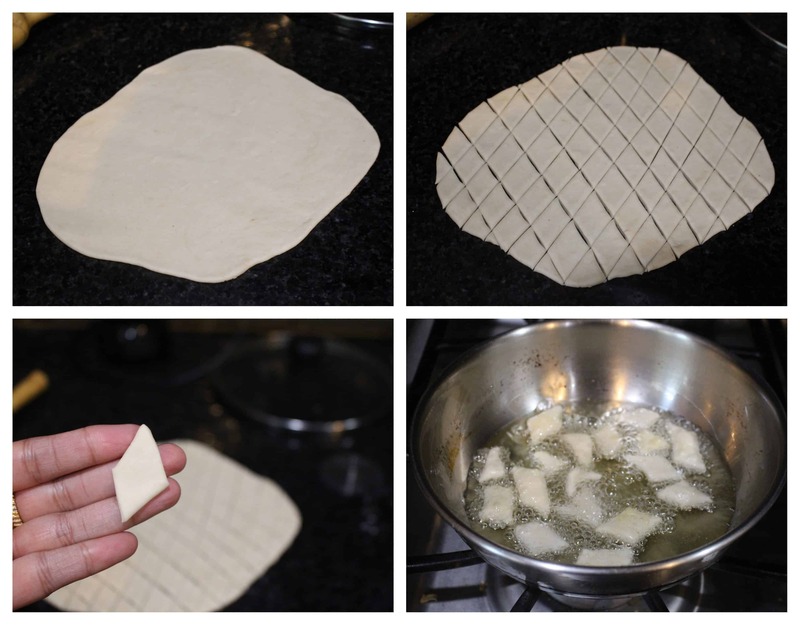 Divide the dough into 2 parts and make a ball with one of the piece. Slightly dust the work surface with flour and roll the dough out to a circle about 1/8th of an inch thick. Makes diamond shape or square shape cuts in the rolled dough and separate the pieces. Meanwhile heat a pan with oil to fry the prepared dough. Keep the heat on low to medium. 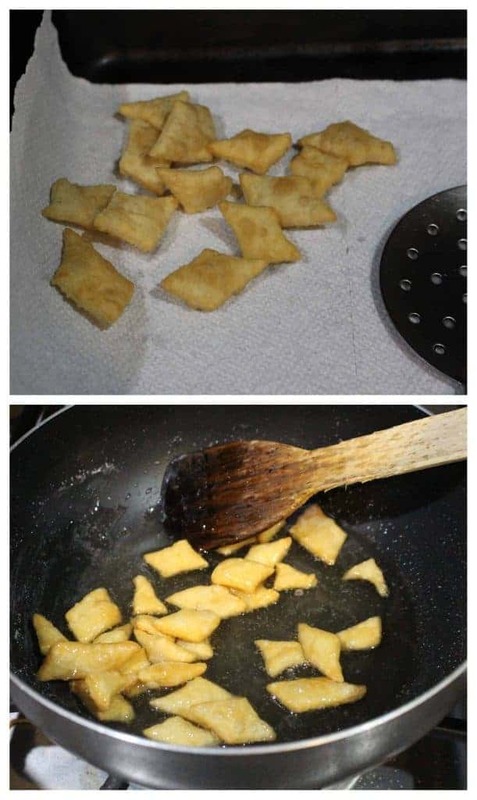 Once the oil heats up, add few pieces of the shaped dough into the hot oil and fry it in low flame until it is golden brown and crispy. Make sure that you fry the shakkarpara at a very low heat or else they would not crisp up. It will take a little while for the dough to fry up, so be patient and finish frying all the pieces. 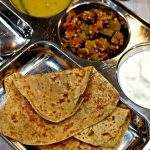 Remove the fried shakkarpara on a paper towel lined tray. Let them cool down to room temperature before coating it with sugar syrup. Measure the sugar and add the water. Boil the mixture in medium heat until the sugar dissolves. Keep Boiling until the syrup comes to a 2 or 3 thread consistency. The syrup will be quite sticky when it ready and when you take a bit of syrup in between your fingers and stretch, it should form 2 or 3 strings. At this stage turn off the flame and let the syrup cool down. When the syrup is warm, add the fried pieces in batches and remove it with a slotted spoon and lay it on a wide tray. Repeat the same with the rest of the pieces. If the sugar syrup crystallizes too much, you could warm it a bit and then repeat soaking the fried pieces. Mix the coated shakkarpara pieces that are in the tray to separate them and also this air dries them. When the mixture is completely dry, it is ready to be stored in an air tight container. When kneading the dough, make sure that you knead it to a stiff dough. Fry the shakkarpara in very low heat to make them crispy. If you fry it high heat, the outside will be golden brown, but the shakkarpara will remain chewy inside. Slightly warm the sugar syrup if it becomes too thick when coating the shakkarpara. I found it easier to finish frying all the dough pieces and then making the sugar syrup. This way I can make coat all the fried pieces back to back. Shakkarpara | Shankarpali are sugar coated diamond shaped biscuits that has been y favorite as a child to this date. 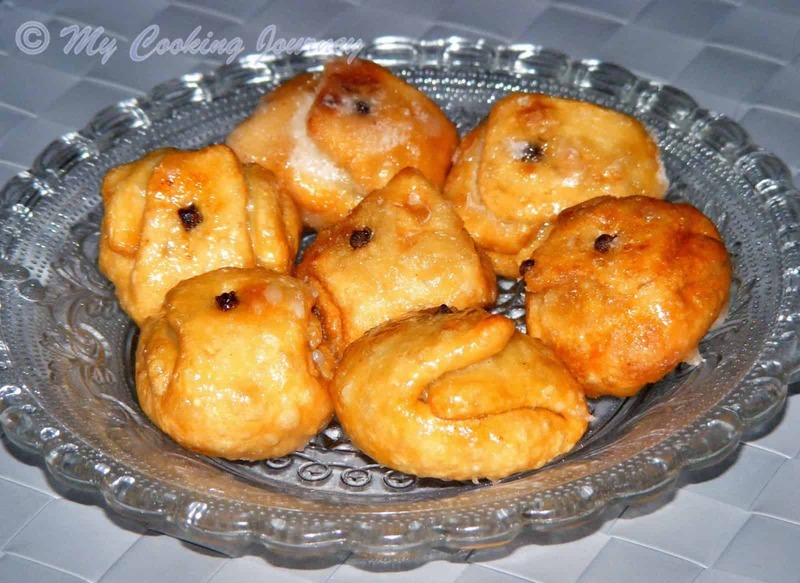 Enjoy this traditional sweet for this Diwali. When kneading the dough, make sure that you knead it to a stiff dough. Fry the shakkarpara in very low heat to make them crispy. If you fry it high heat, the outside will be golden brown, but the shakkarpara will remain chewy inside. Slightly warm the sugar syrup if it becomes too thick when coating the shakkarpara. 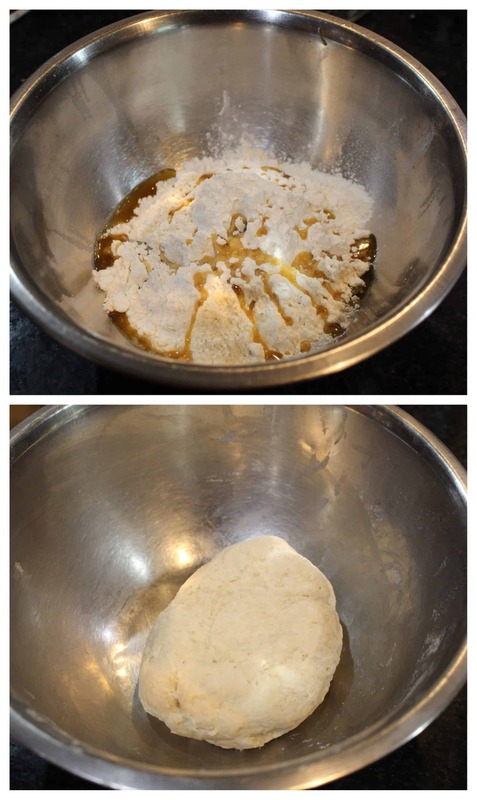 I found it easier to finish frying all the dough pieces and then making the sugar syrup. This way I can make coat all the fried pieces back to back. That is a classic diwali treat, Sandhya. Perfectly made. Omg, ultimate shakkarpara, if i make these cuties, i would keep myself away from them. Dangerously addictive they are na.. I could finish off the whole batch in one sitting. They have turned absolutely yum. 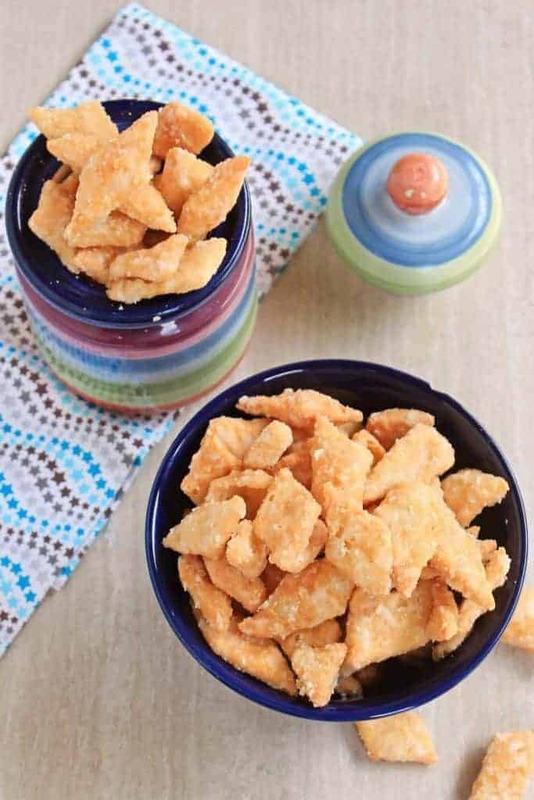 Such an addictive snack Sandhya. Takes me back to my school days!Your jar looks so colorful and cute :).Will come back and check out your diwali peda and savory collections. 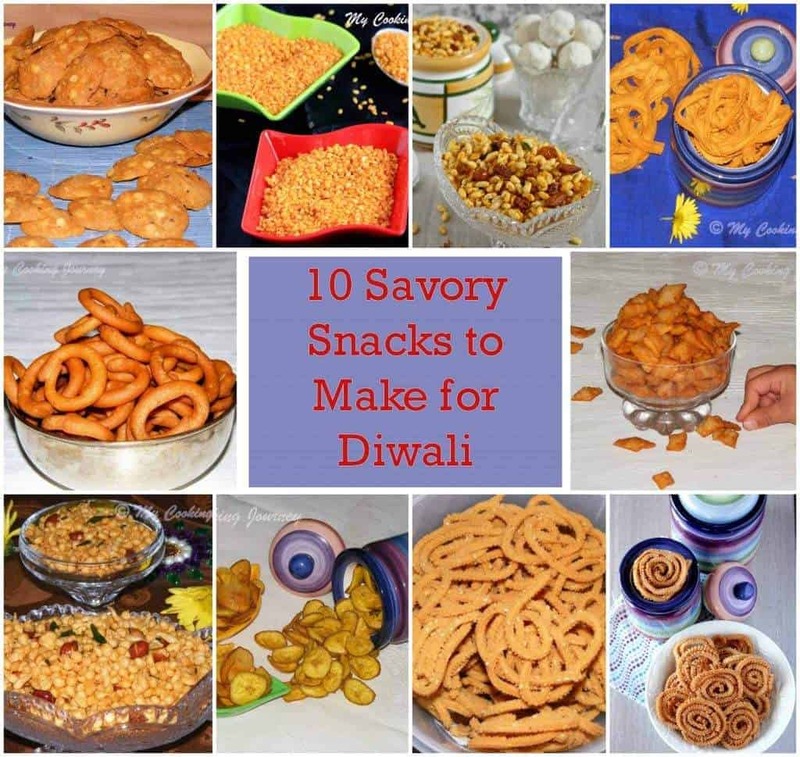 Sandhya, I loved all your recipes under Diwali theme this week. Aptly picked traditional treats associated with the festival. Shankarpali look delicious. 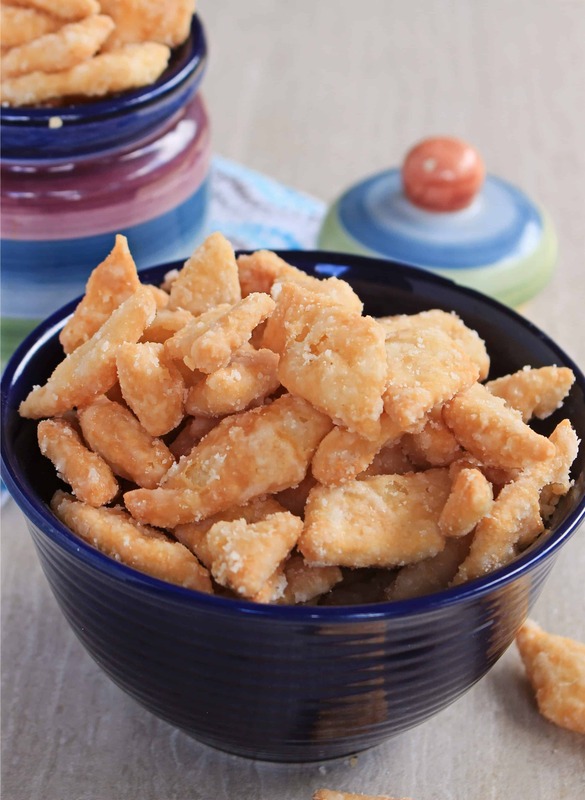 While we have literally grown up eating these, I am always partial to the savory version…these are so quick to make and make a great snack! what a great snack to have around to munch on!! 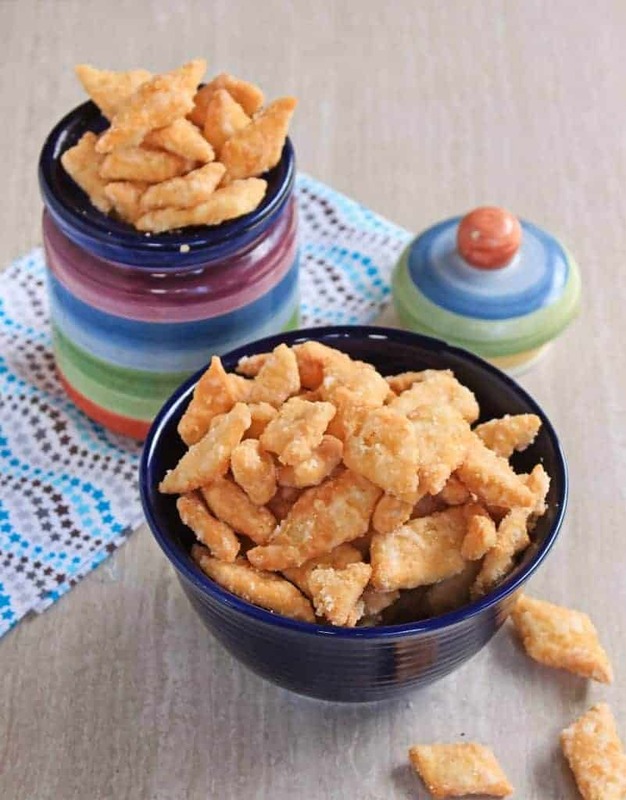 I love these sweet shakkarpara – so addictive. I can never stop myself from eating these. 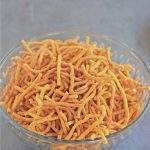 One of the favourite snack in diwali. 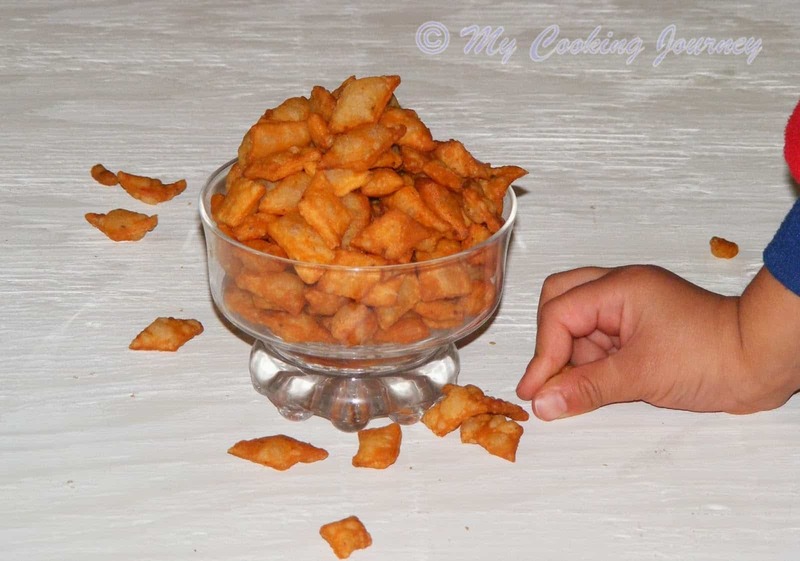 I remember my mom making this, though I love the savoury version, I am sure my kids would love this. such an addictive snack! diwali or not this is one irresistible one!!! perfectly done, seeing all ur diwali posts i just made my list!